It is indeed a privilege to write for this commemorative volume marking 40 years of DVV’s work. As an institution that has focussed consistently on promoting adult education policy and praxis and not veered from this agenda despite a growing de-prioritisation of this issue, I felt that it would be fitting to use this opportunity to remind us of the transformative potential of literacy and education for women from marginalised communities. After all, ultimately it is not literacy rates but what people do with literacy that makes the engagement with adult learning valuable, meaningful and essential. For all the tom-toming of the benefits of women’s literacy, adult literacy is low on the Indian Government’s list of priorities and a low priority for civil society organisations as well. The gap between the rhetoric of policies and the ground level reality is significant. After the much-touted successes of the literacy campaigns of the late 80s and 90s, the Government’s subsequent continuing education pro gramme failed to take off. Put it down to a lack of political commitment, absence of a vision to invest in and sustain adult literacy and numeracy and a failure to develop programme content, pedagogy and a delivery mechanism that responds to learners’ needs and contexts. In an overall environment that is not particularly enabling, it is important to emphasise the more heartening – and perhaps more useful – realisation, that despite all the institutional apathy, adult literacy and educa tion remains a powerful force of inspiration, hope and empowerment for hundreds of thousands of Indian citizens. In this article, I will draw on my experiences of working with Nirantar, a resource centre for gender and education, located in New Delhi, and juxtapose my nar rative with the journey of Shanti, an adult learner, from being a non-literate tribal woman to a new life as a journalist. 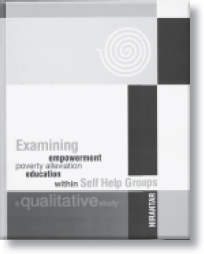 I have chosen to highlight grassroots experi ences and use an experiential narrative style with good reason – beginning from and then building and reflecting on experience and action are the foundations on which adult learning and feminist praxis are built – appropriate, I thought, for this volume which recognises the support provided by DVV, precisely to catalyse such processes of change. Set up in 1993 with a mandate to empower women through literacy and education, Nirantar’s work includes working with grassroots programmes, to develop literacy and educational programmes, material, curricula and pedagogic approaches that kept the interests and lived realities of such women in focus. In its initial years (1993 – 1997) Nirantar collaborated closely with the Mahila Samakhya (MS) programme1 in Chitrakoot district (formerly Banda district) and since 2002 has been working independently in the area. Chitrakoot district is amongst the poor est districts in India; it is dacoit (bandit) ridden, with a significant tribal and dalit population, low literacy levels, and a high degree of violence towards women. The Mahila Samakhya programme started working here in 1989 and during the initial years the programme addressed a variety of issues: struggles against landlords and forest contractors, demands for education, health, and water. A particularly in novative effort involved training non-literate rural women as hand-pump mechanics. This initiative was born of a need to address the water scarcity in the region and a non-functioning government water department. These interventions had a number of spin-offs, including a growing demand for literacy, new skills and information. 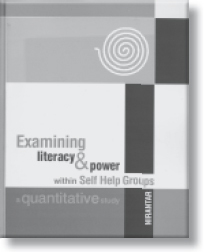 In this context literacy gradually came to be seen as a skill that would enable women to deal with their environment from a position of strength and a number of innova tive strategies with which we were involved were tried to address this demand with varying degrees of success. In 1995, Shanti lived in Manikpur village in Chitrakoot district and used to work as a helper at a government run childcare centre where she earned a paltry amount and her supervisors picked on her. When she heard about the Mahila Shikshan Kendra (MSK) a residential educational school being run for women and adolescent girls, she decided she wanted to attend. She was not literate and saw the MSK as an opportunity to improve her job opportunities. And possibly a chance to get away from a violent husband. But getting to the MSK was not easy. Appalled that a grown woman and mother of five should want to go to “school”, convinced that she was going to meet other men, her husband opposed her decision tooth and nail. The usual barriers were put up – Who will look after the children? Who will do the housework? Shanti was determined to go, but was scared of the consequences. She finally went despite her husband. When her husband did not provide food for the children while she was away, she pawned her jewellery and asked the neighbours to look after them. The programme staff visited her home regularly to see that they were ok. Throughout the six-months she was tense but continued with the programme never-the-less. According to Shanti, things changed after she returned from the MSK. Rather, she had changed. She had talked about the violence she had experienced in her life while at the MSK. And had learnt that she was not the only one experiencing it. She couldn’t stop the violence but was able to negotiate better. She says she no longer felt scared of the consequences of her husband leaving. She now had a new support system. The MSK experience gave her a new status. While at the MSK, she had written a letter to her husband, which was read by him and the entire neighbourhood in amazement – concrete proof that she had learnt. Neighbours now approached her for information. She began leaving the house and got involved with producing Mahila Dakiya, a local broadsheet being brought out by the women supported by MS, as a way of keeping up with their literacy. The production of Mahila Dakiya stopped abruptly in 2000. But Shanti and a few others were hooked. They believed in the product, had begun establishing an identity as reporters and were confident that Mahila Dakiya could exist independ ently. They told Nirantar that they were keen to continue with our support. Thus a new product – Khabar Lahariya – was born in May 2002. Today Shanti and eight other women are journalists involved in producing Khabar Lahariya (or “News Waves”). In Shanti’s narrative, three educational interventions are mentioned that are critical moments in her educational journey. I would like to discuss these briefly, as they are important strategic interventions, which highlight some principles that Nirantar grappled with – understanding and concretely building on women’s experiences and converting these into meaningful educational strategies; interrogating issues of power within and around the educational process; investing in the learning process and the content of learning, and seeing process and outcome as part of the same continuum. The latter is particularly important as the current discourse of women’s education centres primarily on issues of access. The women and adolescent girls who had acquired basic literacy skills at the lit eracy camps and centres articulated a strong demand for further education. To meet this demand, a six-month residential programme called the Mahila Shikshan Kendra (Women’s Learning Centre) was developed in January 1995. One important dimen sion of this work was participatory curriculum development. After a great deal of experimentation and discussion with the programmes participants and facilitators, eventually the curriculum framework was developed around five themes: land, water, forests, health and society. Literacy and numeracy teaching and learning were woven into this. The challenge during this process was to build on women’s experiential knowledge and make connections with worlds and knowledge systems beyond their own, when in fact several of the participants wanted formal teaching methods and mainstream knowledge… or as the women put it: knowledge that is in school books. It was a process of negotiation that compelled us to engage with the power dynamics associated with knowledge construction and representation and try and resolve the issue of what is worth teaching and knowing. The other intervention related to involving newly literate women to produce their own broadsheet – Mahila Dakiya (literally “woman postman”). The impetus for Mahila Dakiya came from a need to reinforce the skills of newly literate learners by creating interesting and appropriate reading material and by involving them in its creation. The intervention entailed inverting another power-laden relationship – rural women are usually seen as passive recipients of development messages, but couldn’t they become producers of material that reflected their realities and gave them a voice? being written entirely in Hindi, to using smatterings of Bundeli words, to gradually writing some articles entirely in Bundeli. The broadsheet became an important forum for participants to write about their new identities and to begin inverting gender stereotypes and caste hierarchies. When the production of Mahila Dakiya stopped in 2000, Nirantar worked with some of the women like Shanti to establish a rural women’s media collective to produce a community based newspaper called Khabar Lahariya. We did not embark on this venture before asking ourselves and the women: How was the new paper going to take the Mahila Dakiya experience forward? Mahila Dakiya had succeeded on many fronts: by establishing that newly literate women could write for and produce a broadsheet; by creating a publication that gave primacy to issues concerning rural women and broke stereo-typic images of women; and by establishing that reading material can be in the local language. So what next? Some of the discussions were informed by the limitations of the Mahila Dakiya experience, others had to do with new ideas we wanted to introduce. One of the limitations of Mahila Dakiya was that despite the potential, it never grew out of being a “programme broadsheet”. While that had been important in the initial years, it was eventually limiting and the broadsheets readership never went beyond the women associated with the programme. We wanted to expand the boundaries in other fundamental ways as well – Mahila Dakiya had been embedded in the discourses of women’s empowerment. Nirantar was keen that the new avatar enter the world of media and be grounded in the discourses of democratic politics. Clearly, those did not mean that it should lose its feminist politics but rather that it should use this politics to redefine what constitutes news, engender democratic institutions like the media and to strengthen grassroots democracy. This implied that the women-producers and the readers would no longer only be “devel opment subjects” or identify themselves as the subject of social relations but move to becoming “citizen-subjects”. Nirantar also sought to expand the understanding of gender that would inform the newspaper. Over the intervening years, there had been a growing recognition that gender should be looked at in terms of its intersectionalities with other identity based categories like caste, religion, ethnicity and sexuality. In our own work in other areas we had started engaging with such an understanding. We were working with a predominantly Dalit group of women, so we were keen that this perspective should also inform the reports. Another difference lay in the original impetus. In Mahila Dakiya we were concerned with giving voice to the experiences of women, to enable them share their feeling of empowerment with a broader audience. Similarly at the Mahila Shikshan Kendra our preoccupation was with making the breakthrough in getting the women to express themselves in writing. Their abilities to communicate in the oral mode were strong and creative. And they were new to the literate world. Could they be enabled to communicate similarly in the written mode? Having made that transition we now wanted to explore the possibility of women commenting on society and macro-political events and make their opinions available in the public domain. The fact that it would be poor, Dalit women who would be the commentators and have a role in shaping public opinion would, Nirantar believed, challenge the hegemonic control of knowledge powerful sections of society. Khabar Lahariya began publication in May 2002 and is now a weekly 8-pager with two editions (from two districts). It contains predominantly local news (though it does have national and international news sections) and the information covers a range of development issues. Each journalist has her beat and sources. They visit villages and various government offices to gather information and interview people. Sometimes they go outside the district to pursue a story. They scan the mainstream newspapers and magazines to look out for stories that could be relevant. Mid-way through the production cycle they have daylong editorial meetings where they decide which stories should be pursued, which require more information, and which should be dropped. The final writing of the newspaper is done collectively. The women gather for three days to write, edit, design, illustrate and proofread the newspaper. Finally, when the content is ready one of them takes it to Allahabad (the nearest big city) to get it printed. Then comes the distribution. The women also take responsibility for selling the paper. Approximately 2000 copies of each issue are sold every week. And Shanti is an integral part of that team. The women did not become journalists overnight. It has been possible because of a sustained and structured learning process. A process that goes beyond literacy and into areas like learning specialised skills related to journalism, learning to use computers and cameras, emailing and most importantly an education about local and national politics. The article explores what roles adult education and feminist praxis play in challeng ing inequitable gender relations and structures of power. And what possibly are meaningful educational processes that enable women to explore various dimen sions of their person-hood and engage actively with democratic and development processes. Working in the area of literacy is particularly challenging because while the general discourse on literacy views it as a “neutral” skill, it is in fact embedded in a web of power relations which women must negotiate on a regular basis to be able to access literacy. We know how Shanti struggled. But she didn’t struggle alone. Needless to say she would not have made it but for all the support she found. Most women we work with negotiate myriad obstacles on a regular basis to attend the literacy class – this cannot be a testimony for low motivation, which is a popular reason offered for the failure of literacy programmes. Some of the ideas shared in the article demonstrate the tremendous possibilities that literacy and education open up. Shanti, when she embarked on this journey, never thought she would be a journalist. Several others Nirantar has worked with haven’t believed that they would ever learn and surprise themselves when they are able to read a magazine. However, literacy programmes for women routinely set limits – reading the bus numbers, medical prescriptions, or helping children with their homework. Can we aspire to promoting a less instrumental approach to women’s literacy? Some readers may feel that this is the story of a “small island of change” but that is not the case. Shanti is one example, there are many others. Moreover, in novations have served as a basis to develop models. For example, the MSK model has now become an accepted approach – commonly called “accelerated learn ing programmes” or “bridge courses” – in education policies in India. Moreover, the lessons learnt from our experiences of working with women have been brought to bear on mainstream education. Nirantar has thus over the past couple of years engaged with textbook writing initiatives being promoted by government institu tions. One of the things we brought to this involvement was the understanding that educational content should be built around experiential knowledge (without unduly privileging or romanticising the local). Looking at the three interventions described above, there are some commonalities with regard to the learning process. For one, the initiatives have all involved establishing an environment of debate, contestation and consensus building. The learning process has predominantly been a collective one, and thirdly, besides enhancing skills and information levels, it has involved building a perspective on issues. It also reiterates an established fact that learning is a constantly evolving process and points out that continuing education programmes can indeed have a profound impact if they are designed and developed in a suit ably imaginative, flexible and interactive manner. But probably most importantly, the article shows that learning has to be sustained, and for that, investments have been made over a fairly long period of time. Unfortunately, the kind of long-term investment that a “good” literacy programme requires is simply not available. On this special occasion, we reiterate the need for a shared commitment to adult literacy and education at the grassroots level and a need to advocate the issue at a macro policy level, with greater political commitment. 1 The 1986 National Policy on Education makes a strong connection between women’s education and empowerment. And to translate policy prescriptions into action a national level pilot project called Mahila Samakhya – Education for Women’s Equality – was drawn up in 1988. The blueprint for the project, which was drawn up by feminist activists, was unique in several respects: It defined education very broadly, placed the onus of agenda-setting on the programme’s constituency – poor, rural women from marginalised back grounds – and provided a space for women’s organizations to collaborate with the programme. Literacy was to be neither an “entry point activity” nor articulated in instrumental terms but to be organized when women demanded it.